Every day, biologists face the challenge of interpreting the patterns and processes of highly complex systems such as genomes, trait complexes, or communities. 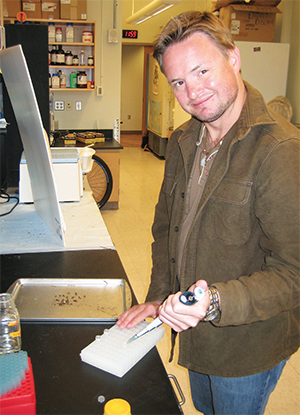 Zachary Marion, a graduate student in the Fitzpatrick Lab, is tackling the question of how biologists can reduce the diversity and complexity of these systems in a meaningful and understandable way in his study system of North American fireflies. With help from several funding sources, including NSF, DDIG, Hollaender, Fite, and Science Alliance awards, he discovered regular patterns in this defensive complex. Unsatisfied with traditional statistical approaches, Marion borrowed from community ecology and developed a novel and intuitive statistical framework to describe phenotypic diversity. He looked at the average chemical diversity within a mate-signaling strategy and the effective number of distinct chemical cocktails present within a species. One genus of fireflies, for example, does not make toxins themselves. Called femmes fatales, Photuris fireflies mimic the flashes of other species. When suitors approach in hopes of mating, they are eaten and their chemical defenses are stolen. Using the method described above, Marion learned that the average femme fatale possesses few compounds relative to other fireflies, but are quite different from one another, most likely due to random sampling of their prey. Marion received several awards during the EEB awards ceremony this spring. In addition to the Fite Award, which recognizes an outstanding graduate student in the Division of Biology, he received the Outstanding Publication by a Graduate Student award from EEB for his article “Extending the Concept of Diversity Partitioning to Characterize Phenotypic Complexity.” Marion also received the Thomas G. Hallam Appreciation Award, which is awarded by EEB graduate students to an individual for outstanding contributions towards improvement of the graduate experience.